Armchair Generalist wonders if Israeli Prime Minister Ehud Olmert's mush-mouthed mumblings about "drastic measures" if Iran does not remove the Farsi word for nuclear from its vocabulary is just bluster, or something worse. I vote for bluster, in large part because of Olmert's own political problems. Olmert is under pressure to resign, most immediately because of a corruption scandal, but also because of lingering anger over the failed 2006 mini-war with Hezbollah in southern Lebanon. Back then, Israeli reservists had assembled a petition demanding Olmert's resignation, a sign of how low Olmert's national security credentials had dropped. Olmert's posture as being strong on defense took another beating earlier this year, with the publication of a report highly critical of how Olmert and top IDF commanders misconceived and mismanaged the Lebanon war. At that point, a majority of Israelis polled said that Olmert should resign. SecState Condi Rice talks about extending America's nuclear deterrence "shield" over Israel as a warning to Iran (or any other adversarial nation) not to consider using or threatening to use nuclear weapons against that country. It's not necessary for two reasons. First, the Cold War is over. No one's impressed by the paper tiger of threatened nuclear immolation. Second, Israel's leadership is scary enough with its 150 nuclear devices - they really don't need our "assistance" other than the $2-3 billion we give them, despite their continued disruptive behavior. Even better, there are the obliging enemies of Israel, such as Iranian president Mahmoud Ahmenidijad, who may have made fewer threatening statements in the direction of Israel, but hasn't exactly shut up completely. So, the verbal exchanges between Tel Aviv and Tehran continue. Therefore, there's every reason to think that Olmert is more than willing to turn up the volume about Iranian threats to drown out the clamor about his deeply troubled prime ministership. It's unclear how successful this effort will be, however. Not even the White House is happy with Transportation Minister Shaul Mofaz's statement that an Israeli strike on Iran was "unavoidable." Israelis are fimmediately worried about events in Gaza more than Iranian nuclear plans (whatever they really are). 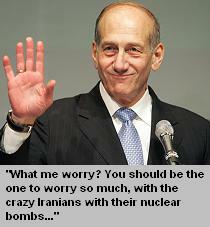 In other words, Olmert can't count on everyone's stupidity, all the time. US nuclear strategy: what's left? What's a nuclear-armed superpower to do? Without an arms race with a rival superpower, the impetus for maintaining a bulging nuclear arsenal collapses. Actual use of nuclear weapons, even in the noble pursuit of counter-proliferation, seems like overkill. The Defense Department will have a hard time structuring US nuclear forces around an enemy that does not exist yet, and may never emerge. While the nuclear club might seem like a good way to scare non-nuclear countries into doing what the US government wants, the track record of compellence thus far is poor. Why, then, does the United States need a large number of nuclear weapons? Why does it need to invest in upgrading to new technologies? Beyond the minimum arsenal needed to deter a few other nuclear powers--a fraction, perhaps, of what the US has today--why have any nuclear weapons at all? The only convincing answer lies in the dynamics of regional conflicts. US theater strategy for a few key hotspots doesn't depend on nuclear options, but nuclear weapons might enlarge, to a small but significant extent, the number of choices available. If the relationship between the two Koreas were ever to disintegrate again, if the United States felt obliged to intervene in a war between India and Pakistan, if tensions in the Middle East were to snap...You have to strain a bit to summon the sort of international relations specters that are credible enough to be frightening, but they do exist. In these situations, the threat of nuclear escalation might be necessary to steer the course of events away from awful destinations, as the US did in the 1973 Arab-Israeli War. Obviously, the United States needs to have the means to deliver on these threats for them to be credible at all. Even in these scenarios, the United States doesn't need a huge nuclear arsenal, and certainly not one centered around ICBMs pointed at fixed targets. Nuclear-tipped missiles or bombs can reach regional targets more readily from ships and aircraft than silos in North Dakota. Seapower and airpower better control the tempo of threats. Ships and planes can approach a troubled region, and then withdraw. ICBMs only "send a message" when they're launched. Not only has the script of nuclear threat changed, but so too has the setting. The motivation of the major actors--India and Pakistan, China and Taiwan, North Korea and South Korea--remains the same. However, there is no rival superpower waiting in the wings to swoop in at a dramatic moment to seize an advantage against the American protagonist. Regional conflicts are far less complex--and they're already complex enough to give diplomats and military planners headaches. The US nuclear arsenal has little precedent. It has the terror factor of Greek fire, but its potential for actual use is far less. It has the mobile hitting power of the Roman legions--but so do American conventional forces. It has the same ability to give the country with the edge in technology and numbers that the Maxim gun and the dreadnought very briefly gave Great Britain. On the other hand, nuclear weapons inspire more intense opposition to their proliferation than these earlier weapons, and the practical hurdles are far less. Unfortunately, an unprecedented advantage in numbers and technology does not automatically translate into unprecedented benefits. Beyond arguments about the Reliable Replacement Weapon, the implementation of the Nuclear Non-Proliferation Treaty, or the Iranian nuclear program, the same overarching question remains: beyond the minimum requirements of deterrence, what do nuclear weapons buy us? The answer remains the same: in the pursuit of national security, not much. Armchair Generalist has a short review of Poisonous Affair: America, Iraq, and the Gassing of Halabja that's worth reading. As you might expect, the book adds depth and complexity to our understanding of one of the signature events of the last few decades, Iraq's use of chemical weapons against its own population. By "depth," I mean details that show how countries develop and use chemical arsenals. By "complexity," I mean the larger story around a particular incident, including the US government's willingness to turn a blind eye to Iraq's chemical weapons program during the 1980s, when containment of Iran was the bigger priority. A side note: we've yet to come to grips, morally and practically, with chemical, biological, and nuclear weapons. A sure sign is when you don't know what to call something: are they weapons of mass destruction? Not exactly, since chemical and biological weapons might be used "tactically" (i.e., in a very limited scope on the battlefield), and not just "strategically" (intended for mass destruction). Is it better to call them unconventional weapons? It depends on the context, perhaps. For national militaries, they certainly are a different category than small arms, tanks, and helicopters. However, for anyone in the business of inspiring terror (governments and private organizations may both apply), they're just another kind of terror weapon, with particular advantages and disadvantages. Maybe it's not worth trying to lump them together at all--except in the contexts, such as proliferation of them as terror weapons, when they do inspire a shared abhorrence. If we choose a term that names but encapsulates all of them, such as CBRN (chemical, biological, radiological, and nuclear). Unfortunately, naming all of them begs the question, how are these things alike? If you can't name something effectively, good luck on managing it. Armchair Generalist notes that the chlorine attacks in Iraq appear to be dwindling or stopped. Maybe the insurgents noticed how ineffective they were? We know that people can buy lab equipment and set up small scale production capable of producing BW agents. And yet... no earth-shattering kaboom. To avoid repeating myself, here's what I've already written on this subject. I'll add a small coda: in some cases, terrorist groups may want to create the impression that they're about to get some kind of unconventional weapon, even if they're really not doing that. The bluff is cheaper than the actual program, and in some contexts, just as effective. On the other hand, the bluff can also backfire. Since terrorists have brains, they do think through the pros and cons of nuclear, biological, and chemical weapons, for real, or as a bluff. Terrorist groups have internal arguments about this topic, and official policy can swing one way or the other. It's a mistake to assume that, just because a scary weapon exists, terrorists will pursue it with an ant-like intensity and mindlessness. The possibility exists, but the probability is lower than most people think.